This time of the summer in San Diego and elsewhere, you're bound to see boxes of elongated yellow flowers for sale at farmers markets. If you haven't figured out what they are, they're squash blossoms. Left alone on the plant, they eventually give way to zucchinis or some other form of summer squash, but they're a delight in their immature state. In Mexico, they're often chopped, sauteed, and incorporated into quesadillas. In other parts of the world, like Italy, they're stuffed, breaded or battered, and fried. Those yellow petals become the vessel for cheese or vegetables or minced meats--or even sweets. 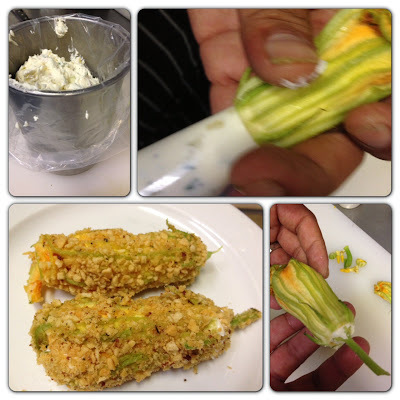 As delicious as stuffed squash blossoms are, a lot of us find them challenging to make, so I went over to The Red Door in Mission Hills, which just celebrated its fourth anniversary, so executive chef Miguel Valdez could give me a primer. His are everything you want in a squash blossom--packed with interesting flavors in a cheese stuffing that is just a bit gooey, but encapsulated in a crunchy floral container. The first tip Miguel gave me was the most basic--how to select the blossoms. They should look fresh and firm, not wilted or browned around the edges. But you also want them closed, not wide open. Trish Watlington, The Red Door's owner, who has a garden on her property that grows much of what the restaurant uses, also told me that when you pick them, wait until late afternoon after they've opened. By then they'll have closed and be at the perfect stage. When you're ready to prepare them, Miguel advises, don't rinse the blossoms. They're too fragile for that and will bruise. Instead, fill a bowl with cold water, and after opening the blossom just enough to check for bugs, dunk the blossoms in the water and then lay them down gently on paper towels. Once the vegetables are at room temperature, you'll make the stuffing by stirring them together with the two cheeses and some salt and pepper to taste. Then fill a plate or flat container with bread crumbs. They don't have to be store purchased. If you have stale bread or crackers (or crackers you enjoy), pulverize them in the food processor. Now, what's your stuffing technique? Here's where things can go seriously wrong--I know because I've been a perpetrator of this. Instead of trying to open the blossom and fill it from the top, keeping the petals open, scratch that. It makes a mess and tears the petals. What you want to do instead is slice off about a quarter inch of the bottom of the blossom, where the stem is. Keep it though. You'll fill the blossom from that clean opening and then insert the bottom/stem inside so that it will look whole. Brilliant. Another tip Miguel offered also related to stuffing. If you're doing this solo, filling the pastry bag can be a tricky mess. Instead, pull out a tall container--like your utensil holder on the sink. Place the empty pastry bag inside and fold the top of the bag over the container. Then your hands are free to fill it with your stuffing. Pull the top up and twist it gently to ease the stuffing solidly down toward the tip. At that point, gently place the tip into the bottom of one of the blossoms to measure how far you need to cut (assuming you are using a plastic pastry bag or a plastic storage bag and not a pastry bag with plastic tips). 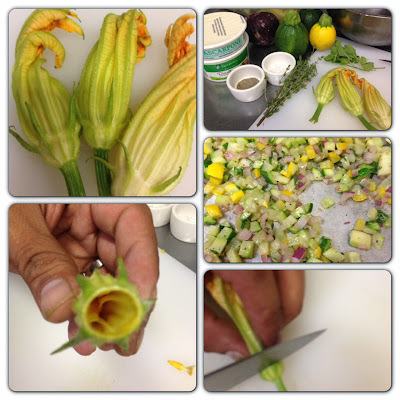 Then you can cut the tip and start squeezing, filling the blossom until the top of the petals begin to bulge a little. Pull out the pastry bag and insert the stem piece, wiggling it to work it just inside so it will stay put. Now you're going to put it all together. Using one hand (to keep the other clean), gently dip the stuffed blossom into the egg, shake off the excess, then dredge it lightly in the bread crumbs. When you've done all of them, put them in the refrigerator to chill for about an hour or, if need be, overnight. Then you're ready to fry them. Use a vegetable oil and heat in a tall pot to 400 degrees. Add the blossoms (don't crowd them) and give them two minutes in the fryer. Remove and drain on a paper towel. Serve them on greens or over a favorite sauce. And, here's the final tip. Be creative. Last night, The Red Door served stuffed blossoms for dessert. The stuffing was Nutella and cream cheese, breaded in panko crumbs, fried, then dipped in dark chocolate and chopped walnuts. Who knew...? Gently wash the squash blossoms by dipping them a few times into a bowl of cold water, then lay them carefully on paper towels. Heat olive oil in a pan and add diced vegetables and herbs, sauting until soft. Spread on a sheet pan to cool so added cheese won't melt. In a bowl, mix the two cheeses and the cooled vegetables with salt and pepper. In a large bowl, whisk the eggs until they're quite liquid and bubbly and there are no strands of egg whites. Fill a plate or flat container with the bread crumbs. Squeeze the mixture into the blossom until the petals begin to bulge. Pull the pastry bag tip out and carefully insert the stem into the hole. When all are stuffed, dip the blossoms into the egg, then with one hand, dredge the blossoms lightly in the bread crumbs. They should be covered with the crumbs but not so thick you can't see the blossoms. Place on a plate or tray and refrigerate. You can let them sit for an hour to firm up or even overnight. If you have leftover cheese mixture or eggs, you can keep these for other uses.